Acorelle Organic Baby Cleansing Water Without Rinse eliminates impurities smoothly thanks to its natural composition rich in thermal water of Castéra-Verduzan. Recognized for its soothing properties, it contains mineral salts and trace elements that moisturize and protect the skin against external aggressions. The combination of vegetable glycerin and organic aloe vera brings softness and comfort to baby's skin. Its pump format offers easy and hygienic application. This baby care seduces with its aqueous texture and its natural scent with notes of orange blossom and almond. 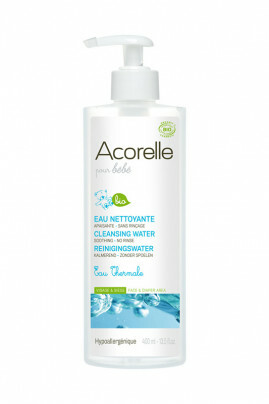 Hypoallergenic, Acorelle Organic Baby Cleansing Water is specially designed for the delicate skin of toddlers. Apply this rinsing cleansing water with a washable cotton or organic cotton to face, body and baby seat to remove all impurities. Do not rinse but dry thoroughly. Avoid contact with the eyes. Keep out of reach of children. Do not swallow. Keep away from heat and light. Natural ingredients that respect the baby's skin! AQUA (THERMAL SPRING WATER), CENTAUREA CYANUS (CORNFLOWER) FLOWER WATER *, GLYCERIN **, PERFUME (FRAGRANCE), ALOE BARBADENSIS LEAF JUICE POWDER *, SODIUM BENZOATE, POTASSIUM SORBATE, DECYL GLUCOSIDE, CITRIC ACID.